Sciblogs | NZ government climate policy: look, a squirrel! The blue line is actual emissions up to 2008, “with measures” — that is, as affected by policies to reduce emissions. 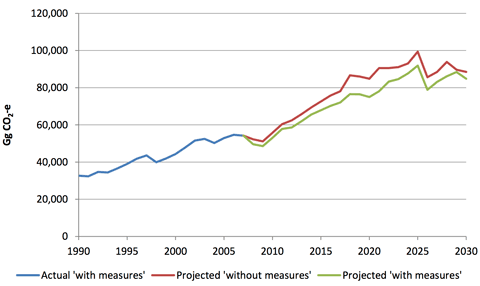 The red line is emissions projected out to 2030 assuming no action to reduce emissions, the green line the emissions that will result after current policy settings are taken into account. Both green and red lines rise substantially up to 2030, and end up at the virtually the same point2 — more than double NZ’s net emissions in 1990. 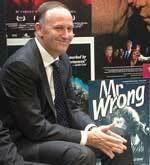 In other words, Tim Groser and his cabinet colleagues have created a suite of policies designed to increase New Zealand’s emissions at a time when they are supposed to be being reduced, and which will miserably fail to meet the government’s own target of a 5% reduction in emissions (using the 1990 baseline) by 2020. The second report released last week is much the more interesting of the two, and makes grim reading for anyone trying to play down the seriousness of the likely changes that confront NZ and its farmers and growers. Four Degrees of Global Warming: Effects on the New Zealand Primary Sector (full report and summary available here) was placed on the Ministry of Primary Industries web site last Friday, but was spotted by TV3 News today. The report is the first study to consider the likely impacts of warming at the upper end of global expectations, and projects climate impacts across the country and on pasture and forest productivity based on two different climate model projections. The pattern of changes is much as described in previous studies — warming spreading down from the north, wetter in the west and drier in the east, greater rainfall intensities, bigger floods and longer droughts — but with much sharper increases in these parameters. The report finds that the most positive impact will be on forestry, where a combination of warming and CO2 fertilisation is expected to increase yields in both Pinus radiata and eucalyptus plantations. This is more than a little ironic, given that the Emissions Trading Scheme policy settings and low carbon price have reduced the attractiveness of forestry planting as a carbon sink. The one thing that might do well in a warmer NZ is the one thing the government seems unable to incentivise with a handout. Perhaps James Cameron could make a film about it? 88 Gg CO2e without measures, 84 Gg with.